Frequently Asked Questions: Q: What car is this kit made for? A: This is a clear protection car bra that protects against daily wear and tear on the front end of your vehicle. This includes protecting against rock chips, scuffs, scrapes, insects, tar, tree sap etc Q: What brand of film will I get? 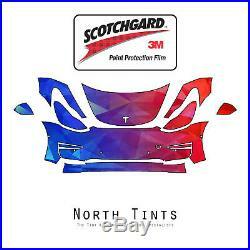 A: We use genuine 3M Scotchgard Series paint protection film for all kits under this listing. Q: Will the film be cut to fit my car? A: Yes the film is pre-cut to fit the cars listed in the compatibility chart above. Q: Which areas of my car will be protected? A: Our Deluxe Kit will include pieces for the bumper, hood (partial size), fenders (partial size), headlights, and mirrors. Q: I have parking sensors and/or headlight washers. A: We can add the pre-cut holes for parking sensors and headlight washers upon request. If no request is given, the kit will not include parking sensor and headlight washer cut-outs. Q: Will the film yellow prematurely? A: No, 3M Scotchgard paint protection film has UV inhibitors that prevent yellowing. Q: Will the kit have wrapped edges? A: Our hood and fender pieces will have wrapped edges that tuck within the panels. This eliminates seam lines and makes for a cleaner installation. The item "Tesla Model 3 2017-2019 PreCut 3M Scotchgard Paint Protection Film Clear Bra PPF" is in sale since Wednesday, November 8, 2017. This item is in the category "eBay Motors\Parts & Accessories\Car & Truck Parts\Exterior\Bras".tints" and is located in Niagara Falls, USA.